Protecting the health, safety and security of our passengers, guests, employees and all others working on our behalf, thereby promoting an organization that always strives to be free of injuries, illness and loss. Protecting the environment, including the marine environment in which our vessels sail and the communities in which we operate, striving to prevent adverse environmental consequences and using resources efficiently and sustainably. Complying with or exceeding all legal and statutory requirements related to health, environment, safety, security and sustainability throughout our business activities. Assigning health, environment, safety, security (HESS) and sustainability matters the same priority as other critical business matters. 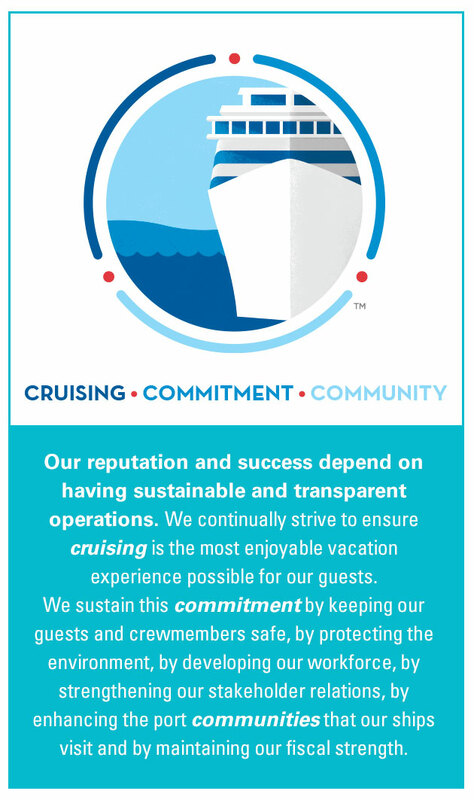 We at Carnival Corporation & plc believe that sustainability is about preserving our environment, respecting our employees and communities, and returning value to our shareholders. Sustainability is not a cost of doing business; it is a way of doing business. As one of the largest vacation companies in the world, we have been committed since our inception to operating responsibly. We know that the journey ahead will contain many challenges and opportunities for stronger stewardship, and recognize that our future success and delivery on our sustainability plans and goals are inextricably linked. As an industry leader, we are committed to and accountable for growing and operating wisely. Carnival Corporation is committed to the safety and security of our passengers, guests, employees and all others working on behalf of our company. We promptly report and investigate all security incidents and take appropriate action to prevent recurrences. We report all allegations of crimes to law enforcement, regardless of the validity of the claim. The Cruise Vessel Security and Safety Act of 2010 requires that statistics for cruise ship crime allegations be posted on the Internet by the US Government. You may review these government statistics at https://www.transportation.gov/mission/safety/cruise-line-incident-reports/.